soulful sounds & rockin' rhythms! swingin' jazz & funkified blues! 10:30-12:00 - TKLS Perspective & Knuf Said. Newport Arts Festival is on hiatus. Please check back for information about future dates. Experience the excitement of Newport Arts Festival - Browse through a colorful marketplace of fine and functional art on Newport’s scenic waterfront. View the work of select regional and national artists, including wearable art, wood and glass work, paintings, photography, pottery and more. Enjoy acclaimed live music from bluegrass to jazz, plus children's entertainment and activities to spark young imaginations. Savor our chowder, raw bar, panini, home-made ice cream and more delicous summertime favorites at the festival cafe. Looking Upwards - We are a Middletown-based, nonprofit agency providing services that support adults with developmental disabilities and children with diverse needs to live fulfilling lives. Looking Upwards produces this festival to share fun and creative inspiration and to raise funds for our mission. Visit the Artist Gallery to discover who is responsible for this wonderful sample of works on view! 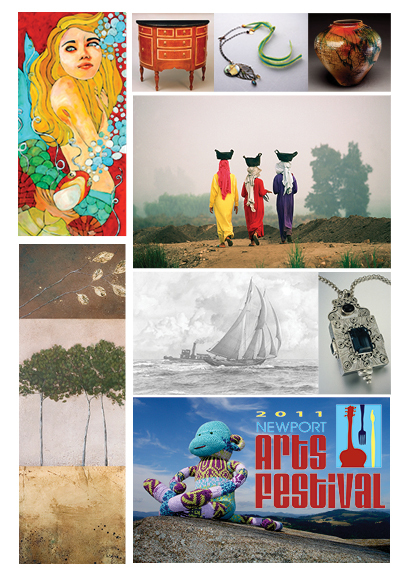 Stay Connected to Newport Arts Festival!